March 19, 2010- Washington, DC - The National Transportation Safety Board has determined that Northwest Airlines flight 188 overflew its destination airport of Minneapolis by more than 100 miles and failed to maintain radio communications because the pilots became distracted by a conversation unrelated to the operation of the aircraft. The NTSB’s accident brief, released today, also note air traffic control shortcomings during the event, and the Board issued two safety recommendations to address those shortcomings. On October 21, 2009, Northwest Airlines flight 188, an Airbus A320 (N374NW) operating as a scheduled flight between San Diego and Minneapolis, did not communicate with air traffic control for approximately one hour 17 minutes. While in this NORDO (no radio communications) state, it flew past its intended destination at a cruise altitude of 37,000 feet. The crew subsequently re-established radio communications and landed without further incident. There were no injuries. The NTSB said that the pilots continued to fly through several air traffic control sectors without replying to any radio commands. 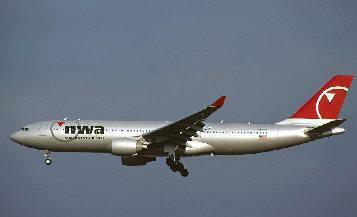 The investigation found that the pilots had become engaged in a conversation dealing with the process by which pilots request flight schedules and during the conversation each was using his personal laptop computer, contrary to company policy. The pilots were not aware of the repeated attempts by air traffic controllers’ and the airline to contact them until a flight attendant used the intercom to inquire about the progress of the flight. The NTSB also found that the lack of national requirements for recording ATC instructions when using automated flight tracking systems, such as directing an aircraft to switch frequencies or to indicate that an aircraft has checked in on an assigned frequency, was a factor in the controllers delay in performing necessary actions and notifications required by lost communications procedures. In addition, because NORDO events of a short duration are not uncommon, the Safety Board found that controllers and managers may have become complacent in completing necessary NORDO actions and required notifications in a timely manner. • The lack of standard procedures for identifying flight crew-ATC communications in ATC facilities that use automated flight tracking systems. • The lack of standard phraseology for identifying the emergency nature of emergency ATC radio transmissions. Recent accidents and incidents such as the midair collision over the Hudson River last August, Colgan Air flight 3407, and the Northwest pilot’s overflight of the Minnesota airport have demonstrated the clear hazards to aviation safety when pilots and air traffic controllers depart from standard operating procedures and established best practices. The Safety Board will convene a 3-day public forum on professionalism in aviation to address methods for ensuring excellence in pilot and air traffic controller performance. The forum is intended to raise awareness by promoting an open discussion between the Safety Board and invited panelists drawn from industry, labor, academia, and government on the importance of developing and reinforcing professionalism in the aviation industry. The forum is scheduled for May 18-20, 2010. More information regarding the forum will be announced in the coming weeks.